Transparency Market Research (TMR) has announced the addition of a new report, titled “Facial Recognition Market - Global Industry Analysis, Size, Share, Growth, Trends and Forecast 2015 - 2022”. According to the report, the global facial recognition market will expand at a marked CAGR of 9.50% during the forecasting horizon from 2015 to 2022. In 2014, the global facial recognition market was worth US$1.3 bn and by 2022, the market is projected to be worth close to US$2.7 bn. The global facial recognition market is driven by the rising adoption of facial recognition technology in web applications. In addition to this, the global facial recognition market will benefit from the development of facial recognition systems to scan subjects accurately in all situations. The extensive application of facial recognition technology in the consumer electronics sector will also boost the global facial recognition market. The widespread acceptance of this technology in the entertainment sector and growing demand for advanced systems in the civil and government sector will also drive the global facial recognition market. Nevertheless, the global facial recognition market will be challenged by the elevated sensitivity of people towards privacy and related risks of shared personal data. Technology-wise, the global facial recognition market is segmented into facial analytics, 3D facial recognition, and 2D facial recognition. The 3D facial recognition technology segment holds a significant share in the global facial recognition market due to its high accuracy in terms of recognizing facial features as compared to the 2D facial recognition technology segment. The technology of facial analytics is an emerging one and hence will record steady growth in the coming few years. According to end use, the global facial recognition market is divided into the retail industry, banking, financial services, and insurance (BFSI), homeland security, military, government and utilities, and others. The government and utilities segment dominated the global facial recognition market. The retail industry segment is projected to witness significant growth due to the increased proliferation of retail outlets around the world. 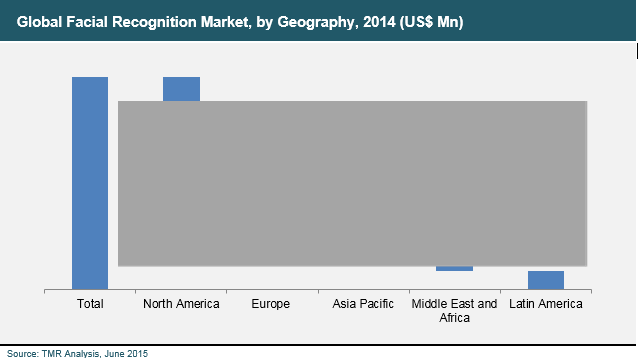 Region-wise, the global facial recognition market is classified into Europe, North America, Asia Pacific, the Middle East and Africa (MEA), and Latin America. North America is expected to continue to hold the largest share in the global facial recognition market during the forecast period. The North America facial recognition market benefits from the high expenditure on security systems in the public and government sector. On the other hand, Europe is projected to experience a rise in the adoption of facial recognition technology with extensive demand for identity validation and border control applications. Furthermore, the active adoption of facial recognition technology in Asia Pacific due to the expanding population and growing need for surveillance systems in the retail industry will drive the overall facial recognition market. Players in the global facial recognition market will benefit from the opportunity presented by the emergence of lifespan determination technology through facial recognition. Furthermore, the proliferation of advanced facial recognition systems with applications in mobile security, drones, and retail will also present significant growth opportunities to companies. Some of the key company profiles present in the research study are those of Cross Match Technologies, 3M Cogent, Aware, Aurora Computer Services, Animetrics, Ayonix Corporation, Cognitec Systems, Morpho, and NEC Corporation.